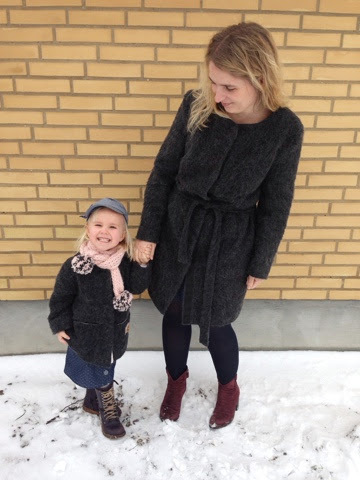 Sew blue dresses: Coats - the mother-daughter-theme continues.. 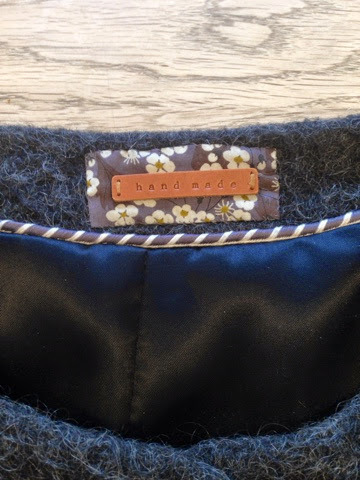 I have been watching all the gorgeous coatigans both in the shops this season and all the loveliness made by trendy sewtionistas online and decided I needed one for myself. 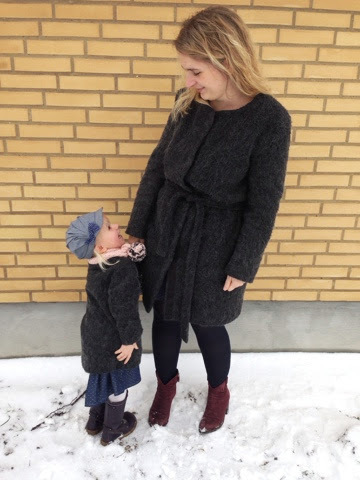 This coat is not warm enough to be a regular wintercoat - at least not here in cold scandinavia - but it's a trusty friend, when you need to look slightly more elegant than you do in a parka coat. 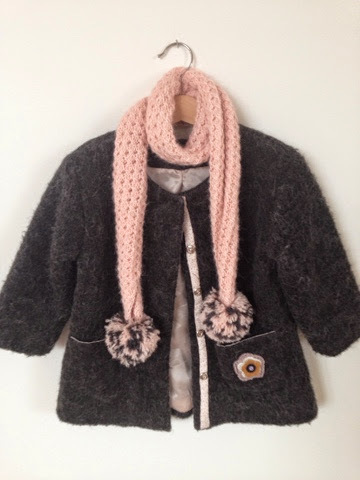 This coat is made using this burdastyle pattern. I altered the pattern slightly since the coat pattern doesn't allow for buttons. I altered the frontpieces to do a small overlap allowing for me to make a row of big snaps to close the jacket. I left out the pockets from the pattern - but now I regret it a bit - where do I put my keys, pepples and papertowels? Here you can see the coat up close. However, the fabric hide the beautifull line drawing giving a bit of shaping to the front - please take at look at the burdastyle webpage to see the line drawing. 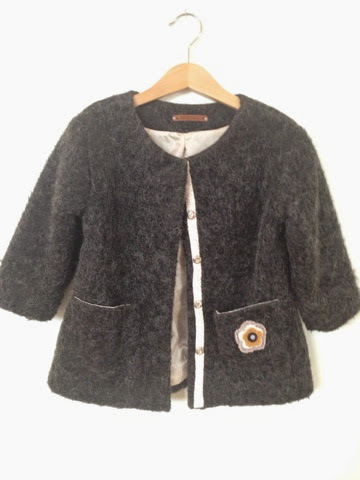 The coat has a coatlining adding a bit of stability to the rather lightweight mohair wool. I made a small tag to add a bit of everyday luxury. And now to the mini-me-coat. I "drafted" the pattern for this coat myself using a sweatshirtpattern one size too big, slicing it down the front, adding a bit to the frontpieces to allow it to overlap and drafting a new lining. It sounds harder than it was, but do give it a try. Childrens clothes is quite forgiving to make. Since this was a remnant piece I wasn't too worried to ruin it. I made small pockets too adding a (bought) crochetted flower to one of them for decoration. I used a remnantpiece in a light rosy collar to stabilize and use as a button placket for the sew-on snaps. Since the coat is quite open around the neck, I asked my mother in law to knit a scarf - and she knitted one in just the right colours for this little number. Thank you! These coats are not very practical but they were a fun sew and I use mine quite a bit for work. 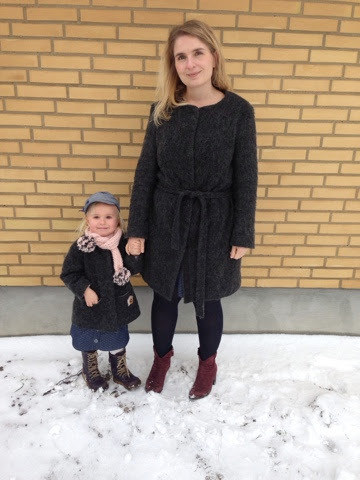 I would like to learn more about tailoring and make a proper wintercoat - perhaps next fall? 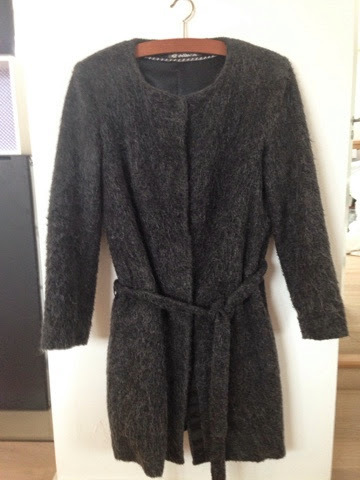 Have you made a warm woolen wintercoat? Can you recommend any books on the tailoring? I have a few more winter sewing projects to show you but I'm looking forward to start sewing for spring. How about you - have you started planning your spring wardrobe? Hvor er I søde begge to! Og vildt flotte jakker altså.